A new study, by scientists from the University of Southampton and National Oceanography Centre (NOC), implies that the global climate is on the verge of broad-scale change that could last for a number of decades. This new climatic phase could be half a degree cooler. The study, published in Nature, proves that ocean circulation is the link between weather and decadal scale climatic change. It is based on observational evidence of the link between ocean circulation and the decadal variability of sea surface temperatures in the Atlantic Ocean. “The RAPID/MOCHA/WBTS mooring array at 26ºN in the Atlantic has been delivering twice daily estimates of the strength of the AMOC since 2004. A unique array, the observations have revolutionised our understanding of the variability of the AMOC on sub-annual, seasonal and, most recently, interannual timescales. An update to the AMOC timeseries has recently been produced. As well as extending the data, the timeseries to October 2012 contains several improvements to the calculation. A dramatic low in the AMOC was observed in winter 2009/10, where the AMOC declined by 30%. This has been shown to have resulted in a sustained reduction in heat content of the North Atlantic. The 2009/10 dip in AMOC strength was followed by a second dramatic low in 2010/11. Historical analogues of double minima in successive winters have been identified in NEMO runs where they are associated with extreme negative values of the Arctic oscillation and have been linked with ocean re-emergence. Interestingly, there is also a link with surface air temperatures and, consequently, European wintertime conditions. 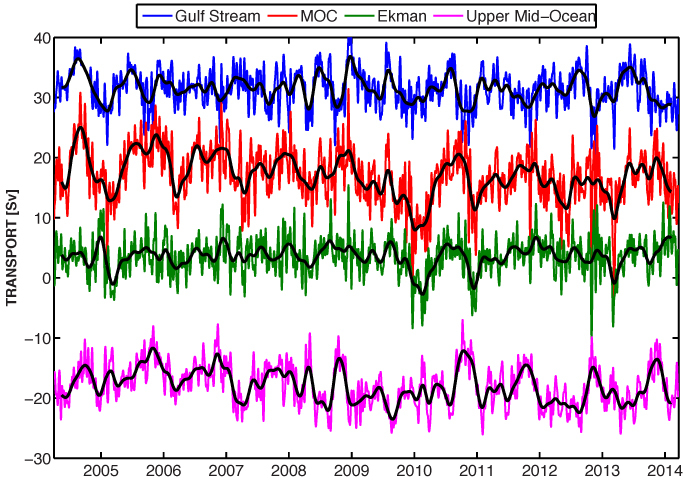 Figure 1:Ten-day (colours) and three month low-pass (black) timeseries of Florida Straits transport (blue), Ekman transport (black), upper mid-ocean transport (magenta), and overturning transport (red) for the period 2nd April 2004 to mid- March 2014. Florida Straits transport is based on electromagnetic cable measurements; Ekman transport is based on ERA winds. The upper mid-ocean transport, based on the RAPID time series, is the vertical integral of the transport per unit depth down to the deepest northward velocity (~1100 m) on each day. Overturning transport is then the sum of the Florida Straits, Ekman, and upper mid-ocean transports and represents the maximum northward transport of upper-layer waters on each day. Positive transports correspond to northward flow. Sea ice is not simple. Some Background is in order. When white men started to explore the north of America, they first encountered the Crees. Hudson Bay posts were established to trade goods for pelts, especially the beavers used for making those top hats worn by every gentleman of the day. The Crees told the whites that further on toward the Arctic Circle there were others they called “eskimos”. The Cree word means “eaters of raw meat” and it is derogatory. 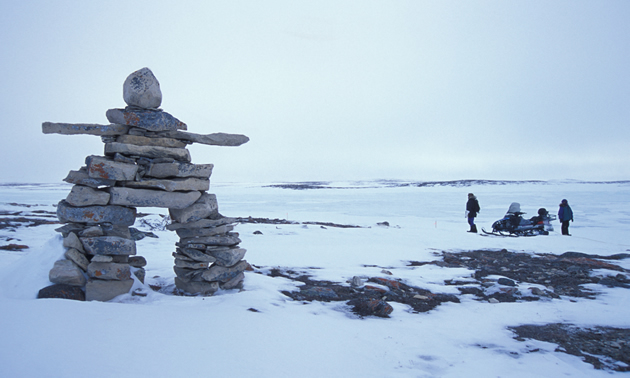 The Inuit (as they call themselves) were found to have dozens of words for snow, a necessary vocabulary for surviving in the Arctic world. A recent lexicon of sea ice terminology in Nunavik (Appendix A of the collective work Siku: Knowing our Ice, 2008) comprises no fewer than 93 different words. These include general appellations such as siku, but also terms as specialized as qautsaulittuq, ice that breaks after its strength has been tested with a harpoon; kiviniq, a depression in shore ice caused by the weight of the water that passed over and accumulated on its surface during the tide; or iniruvik, ice that cracked because of tide changes and that the cold weather refroze. With such complexity of ice conditions, we must recognize that any general understanding of ocean-ice dynamics will not be descriptive of all micro-scale effects on local or regional circumstances. Alarmists only mention positive feedbacks from ice melting, so one is left to wonder why there is any Arctic ice left so many years since the Little Ice Age ended around 1850. Actually there are both positive and negative feedbacks, with one or the other dominating at different times and places. Of course, the basic cycle is the seasonality of sunless winters and sunlit summers. Remember that ice grows because of a transfer of heat from the relatively warm ocean to the cold air above. Also remember that ice insulates the ocean from the atmosphere and inhibits this heat transfer. The amount of insulation depends on the thickness of the ice; thicker ice allows less heat transfer. If the ice becomes thick enough that no heat from the ocean can be conducted through the ice, then ice stops growing. This is called the thermodynamic equilibrium thickness. It may take several years of growth and melt for ice to reach the equilibrium thickness. In the Arctic, the thermodynamic equilibrium thickness of sea ice is approximately 3 meters (9 feet). 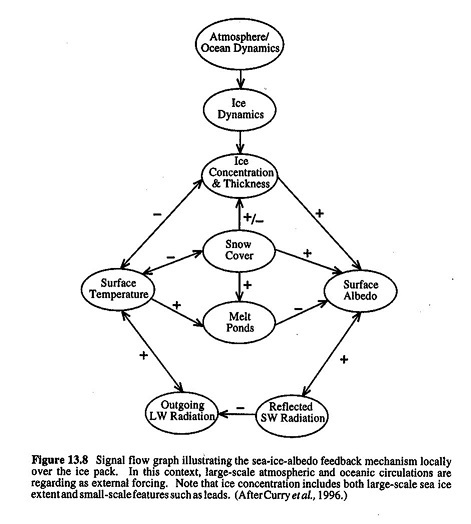 However, dynamics can yield sea ice thicknesses of 10 meters (30 feet) or more. Equilibrium thickness of sea ice is much lower in Antarctica, typically ranging from 1 to 2 meters (3 to 6 feet). Snow has an even higher albedo than sea ice, and so thick sea ice covered with snow reflects as much as 90 percent of the incoming solar radiation. This serves to insulate the sea ice, maintaining cold temperatures and delaying ice melt in the summer. After the snow does begin to melt, and because shallow melt ponds have an albedo of approximately 0.2 to 0.4, the surface albedo drops to about 0.75. 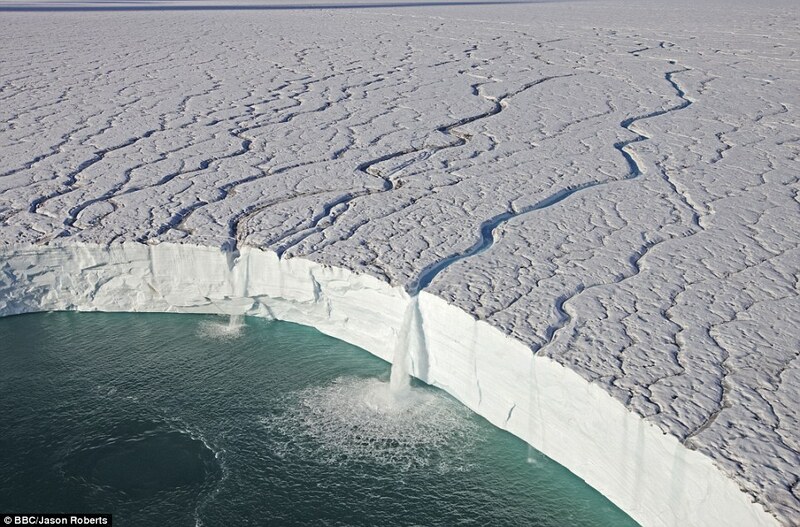 As melt ponds grow and deepen, the surface albedo can drop to 0.15. As a result, melt ponds are associated with higher energy absorption and a more rapid ice melt. Sciences, McGill University, Montreal, Quebec, Canada. Abstract: A combined complex empirical orthogonal function analysis of 40 years of annual sea ice concentration (SIC) and winter sea level pressure (SLP) data reveals the existence of an approximately 10-year climate cycle in the Arctic and subarctic. Summary: Sea Ice Impacts Climate Strongly, this century and beyond. “We find that in a cold, glacial climate snowfall rate over the ice sheets is reduced as a result of increasing sea-ice extent (compare LGM and PDSI experiments). An increased sea-ice extent cools the climate even more, the precipitation belt is pushed southward and the hydrological cycle weakens. We find that the albedo feedback of an extended sea-ice cover in an LGM-like climate only weakly affects the reduction of snowfall rate. 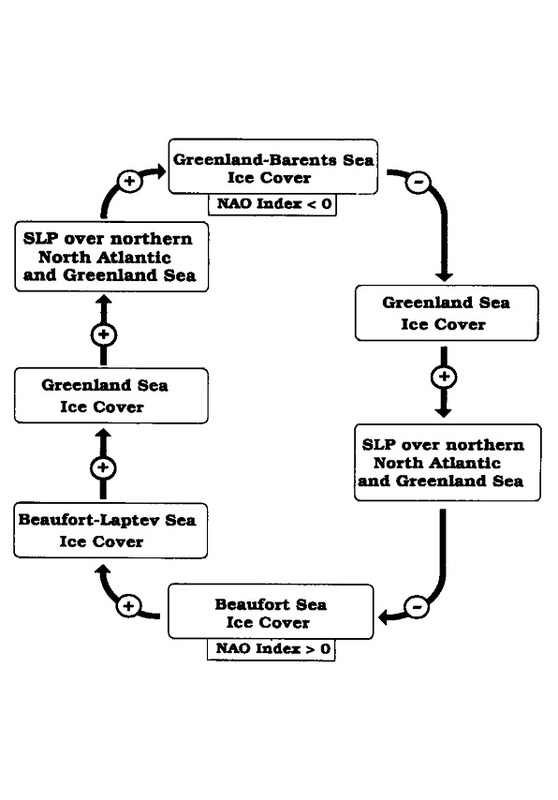 indicating that the insulating feedback is responsible for a large part of the suppression of precipitation by sea ice. It follows that the hydrological cycle is more sensitive to the insulating effect of sea ice than to its albedo. There are two reasons to the larger contribution of the insulating effect to the temperature-precipitation feedback. First, the overall cooling of the insulating effect is about twice than that of the albedo. This by itself is expected to lead to a more significant change in precipitation. In addition, the insulation effect not only reduce air-sea heat flux, it also directly prevents evaporation from ice-covered regions, which are a major source of precipitation over the NH ice sheets (Charles et al. 1994). Regardless of the uncertainties in the underlying principal mechanisms of the sea ice-AMO-AMOC linkages, it is clear that multidecadal sea-ice variability is directly or indirectly related to natural fluctuations in the North Atlantic. This study provides strong, long-term evidence to support modeling results that have suggested linkages between Arctic sea ice and Atlantic multidecadal variability [Holland et al., 2001; Jungclaus et al., 2005; Mahajan et al., 2011]. Here we present observational evidence for pervasive and persistent multidecadal sea ice variability, based on time-frequency analysis of a comprehensive set of several long historical and paleoproxy sea ice records from multiple regions. Moreover, through explicit comparisons with instrumental and proxy records, we demonstrate covariability with the Atlantic Multidecadal Oscillation (AMO). I think I can take a crack as answering some of the questions and pointing at a likely structure for some of the other bits. Why is it whenever the climate changes the climate does not stray indefinitely from it’s mean in either a positive or negative direction? Why or rather what ALWAYS brings the climate back toward it’s mean value ? Why does the climate never go in the same direction once it heads in that direction? IMHO the answer is that there is a hysteresis from water that limits the excursions. On one end, freezing tends to cut down heat dumping as frozen ice does not radiate as much heat to space. On the other end, tropical storm formation limits heat in the equatorial oceans as you get more water evaporation / rise / precipitation cycles and more radiation to space from the tropopause / stratosphere. So we don’t get ‘brought back to the mean’, but rather switch from an ice ball (most of the time) to a warm & wet (10% of the time). This switching is the Malankovitch cycle, and it is driven by changes in the orbital roundness, precession of the equinox, and changes of tilt of the planet (that are not really changes of tilt, they are changes in position relative to the celestial equator. Update May 19, 2015 text added at end. Earlier I wrote an essay about our living on a water world. Then an essay described the role of oceans as a climate flywheel, storing massive amounts of solar energy and thereby stabilizing fluctuations in temperature and climate. A recent post about oceans making global temperature changes drew some comments about downplaying the role of the atmosphere in climate change. So I want to clarify some things. Climate change is a coupled ocean-air dynamic, stimulated by ocean heat transfers into the air, and involving the two fluids (air and water) feeding off each other. To maintain an approximate steady state climate the ocean and atmosphere must move excess heat from the tropics to the heat deficit polar regions. Additionally the ocean and atmosphere must move freshwater to balance regions with excess dryness with those of excess rainfall. The movement of freshwater in its vapor, liquid and solid state is referred to as the hydrological cycle. In low latitudes the ocean moves more heat poleward than does the atmosphere, but at higher latitudes the atmosphere becomes the big carrier. The wind driven ocean circulation moves heat mainly on the horizontal plane. For example, in the North Atlantic, warm surface water move northward within the Gulf Stream on the western side of the ocean, to be balanced by cold surface water moving southward within the Canary Current on the eastern side of the ocean. The thermohaline circulation moves heat mainly in the vertical plane. For example, North Atlantic Deep Water with a temperature of about 2°C flows towards the south in the depth range 2000 to 4000 meters to be balanced by warmer water (greater than 4°C) flowing northward within the upper 1000 meters. The ocean role in climate would be zero if there were an impervious lid over the ocean, but there is not, across the sea surface pass heat, water, momentum, gases and other materials. 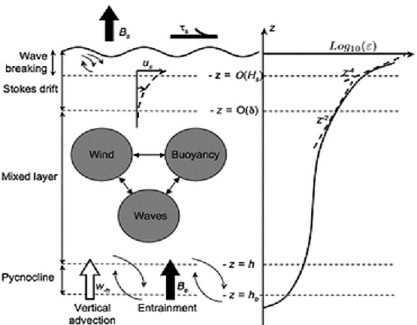 The wind exerts a stress on the sea surface that induces the Ekman transport and wind driven circulation. A lot of factors affect heat transfers from oceans to atmosphere, but the main ones are advection (heat in water flowing horizontally), mixing (vertical upwelling and downwelling of warmer and colder waters) and surface evaporation (latent heat rising with water vapor converted from liquid). The latter is greatly affected by wind which adds to the complexity of the process. For this essay, I will leave on the side the issue of sea ice dynamics, including the latent heat released in its freezing. The ocean can warm or cool the air in a number of different ways. For example, when the air is at a lower temperature than seawater, the ocean transfers heat to the lower atmosphere, which becomes less dense as the heat causes molecules in the air to move farther apart. As a result, a low-pressure air mass forms over that part of the ocean. (Conversely, cool or cold waters lead to the formation of high-pressure air masses as air molecules move closer together.) Because air always flows from areas of higher pressure to those of lower pressure, winds are diverted toward the low-pressure area. Among winds that are affected by such pressure changes are the jet streams, bands of fast-moving, high-altitude air currents. Jet streams supply energy to developing storms at lower altitudes and then influence their movement. In this way, the ocean alters the direction of storm tracks. Some storms even reverse direction as the result of ocean-influenced air-pressure changes. The ocean’s currents make it possible for these weather effects to be widely distributed. Some currents carry warm water from tropical and subtropical regions toward the poles, while other currents move cool water in the opposite direction. 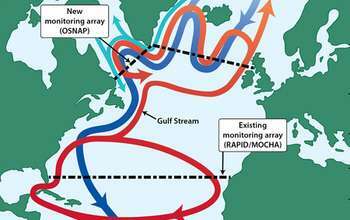 The Gulf Stream is a current that transports warm water across the North Atlantic Ocean from Florida toward Europe. Before reaching Europe, the Gulf Stream breaks up into several other currents, one of which flows to the British Isles and Norway. The heat carried in this current warms the winds that blow over these regions, helping to keep winters there from becoming bitterly cold. In this way, the ocean’s circulation compensates somewhat for the sun’s unequal heating of the Earth, in which the tropics receive more energy from the sun than the poles. Were it not for the moderating effects of ocean currents on air temperatures, the tropics would be much hotter than they are and the polar regions even colder. Besides transferring heat to the atmosphere, the ocean also adds water to the air through evaporation. When the sun’s heat causes surface water to evaporate, warm water vapor rises into the atmosphere. As the water vapor rises higher, it cools into tiny water droplets and ice crystals, which collect together to form large clouds. The clouds soon return their moisture to the surface as rain, snow, sleet, or hail. 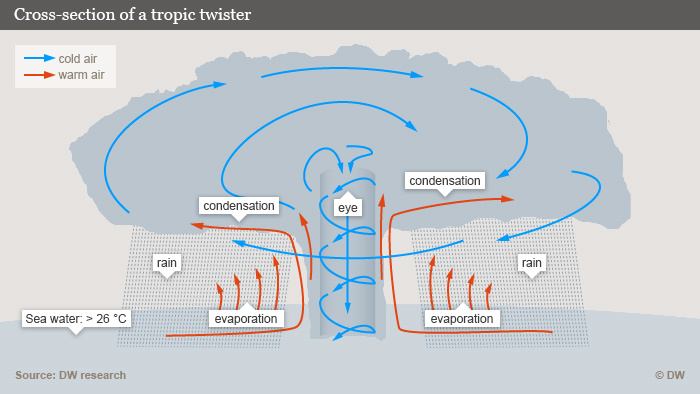 Most evaporation occurs in the warm waters of the tropics and subtropics, providing moisture for tropical storms. Virtually all rain comes from the evaporation of seawater. Though this may seem surprising, it makes sense when one considers that about 97 percent of all water on Earth is in the ocean. The Earth’s water cycle, or hydrologic cycle, consists largely of the never-ending circulation of water from the ocean to the atmosphere and then back to the ocean. Most widely known is the El Nino Southern Oscillation, or ENSO. Many other naturally occurring ocean-atmosphere oscillations in the Pacific, Atlantic, and Indian Oceans have been recognized and named. Some of them have much more of an impact on climate and weather patterns in the U.S. and elsewhere than ENSO. As during ENSO, in many of these ocean and atmosphere interact as a coupled system, with ocean conditions influencing the atmosphere and atmospheric conditions influencing the ocean. However, not all exert as strong an influence on global weather patterns, and some are even less regular than ENSO. Antarctic Oscillation (AAO), also referred to as the Southern Annular Mode (SAM). The AO and the North Atlantic Oscillation (see below) are collectively referred to as the Northern Annular Mode (NAM). The diagram shows the vertical structure of the ocean surface boundary layer (OSBL) and the processes that deepen. The three sources of turbulence are: wind, buoyancy and waves. The bulk of the OSBL can be termed the mixed layer, where the temperature and salinity are approximately uniform with depth, and which is often capped below, at the mixed layer depth, by a sharp pycnocline, which extends deeper into the ocean. Three sources of turbulence, namely wind, buoyancy and waves, drive turbulence in this mixed layer, which then deepens the OSBL. Hence a quantitative understanding of these turbulent processes in the OSBL is likely to be the key to understanding the shallow biases in mixed layer depth. Deepening of the OSBL implies an increase in potential energy, and hence requires an energy source, such as turbulent kinetic energy (TKE). layer, Geophys. Res. Lett., 39, L18605, doi:10.1029/2012GL052932. The Madden-Julian Oscillation is one of the simpler oscillations to understand, partly because of its short 30-60 day cycle. Even so, you can see there is a lot going on, and a lot of variables affecting both strength and timing. But the same dynamic plays out in all the oscillations, including ENSO. First, the atmosphere responds to the ocean: the atmospheric fluctuations manifested as the Southern Oscillation are mostly an atmospheric response to the changed lower boundary conditions associated with El Nino SST fluctuations. Second, the ocean responds to the atmosphere: the oceanic fluctuations manifested as El Nino seem to be an oceanic response to the changed wind stress distribution associated with the Southern Oscillation. Third, the El Nino-Southern Oscillation phenomenon arises spontaneously as an oscillation of the coupled ocean-atmosphere system. Once the El Nino event is fully developed, negative feedbacks begin to dominate the Bjerknes positive feedback, lowering the SST and bringing the event to its end after several months. 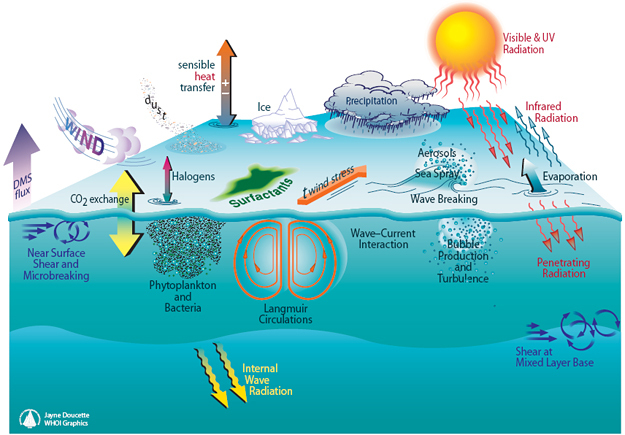 Schematic of the feedback inherent in the Pacific Ocean-atmosphere interaction. This has become known as the Bjerknes feedback. When ocean and atmospheric conditions in one part of the world change as a result of ENSO or any other oscillation, the effects are often felt around the world. The rearrangement of atmospheric pressure, which governs wind patterns, and sea-surface temperature, which affects both atmospheric pressure and precipitation patterns, can drastically rearrange regional weather patterns, occasionally with devastating results. Because it affects ocean circulation and weather, an El Niño or La Niña event can potentially lead to economic hardships and disaster. The potential is made worse when these combine with another, often overlooked environmental problem. For example, overfishing combined with the cessation of upwelling during an El Niño event in 1972 led to the collapse of the Peruvian anchovy fishery. Extreme climate events are often associated with positive and negative ENSO events. Severe storms and flooding have been known to ravage areas of South America and Africa, while intense droughts and fires have occurred in Australia and Indonesia during El Niño events. The picture that emerges from this analysis is that the wind-driven meridional overturning circulation in the upper Pacific Ocean has been slowing down since the 1970s. This slowdown can account for the recent anomalous surface warming in the tropical Pacific, as the supply of cold pycnocline water originating at higher latitudes to feed equatorial upwelling has decreased. The Southern Hemisphere is responsible for about half of the observed decrease in equatorward pycnocline transport. Thus, perspectives on decadal variability limited to the Northern Hemisphere alone are incomplete. The fact that few studies have considered a role for the Southern Hemisphere ocean is presumably a consequence of limited data availability rather than a lack of decadal signal in the southern tropics and Subtropics. The oceanic and atmospheric processes that we have described work together so as to reinforce each other, similar to the positive feedbacks that occur during ENSO events. 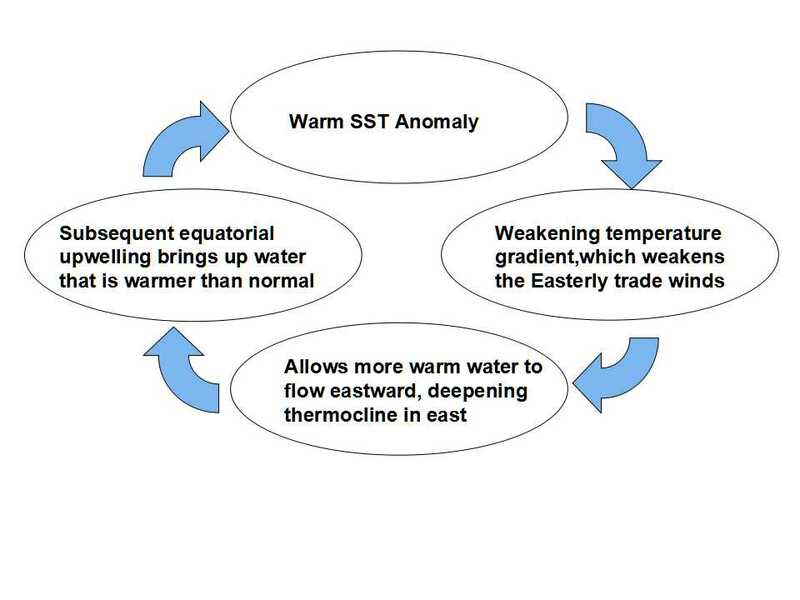 For example, weaker easterly trade winds in the equatorial Pacific would result in reduced Ekman and geostrophic meridional transports, reduced equatorial upwelling, and warmer equatorial sea surface temperatures. Warmer surface temperatures in turn would alter patterns of deep atmospheric convection so as to favour weaker trade winds. If the system is to oscillate on decadal timescales, then delayed negative feedback mechanisms, one candidate for which involves planetary scale ocean waves, must also be important. Similarities in the spatial structures of the PDO and ENSO (both, for example, have phases that are characterized by warm tropics and a cool central North Pacific, and vice versa) have raised questions about the possible interaction between interannual- and decadal timescale phenomena in the Pacific. In particular, since 1976±77 there have been fewer La Nina events, and more frequent, stronger, and longer-lasting El Nino events. behaviour. Alternatively, the observed decadal changes may simply be the low-frequency residual of random or chaotic fluctuations in tropical ocean±atmosphere interactions that give rise to the ENSO cycle itself. In either case, a complete understanding of climate variability spanning interannual to decadal timescales in the Pacific basin will need to account for the slowly varying meridional overturning circulation between the tropics and subtropics. Ocean oscillations are profoundly uncertain, not only because each one is erratic in the timing and strength of phase changes, but also because they have interactive effects upon each other. And with time cycles differing from 1-2 months to 30-60 years the complexity of movements is enormous. Of course, the satellite records have 1998 as the warmest year by a wide margin. And why was that year so warm? It was a super El Nino. This is Oceans making climate, no mistake about it. Oceans make climate is by partnering with the atmosphere. It’s a match made in heaven: Ocean is dense, powerful, slow and constrained; Atmosphere is thin, light, fast and free. Ocean has solar heat locked in its Abyss, Atmosphere is open to the cold of space. Together they take on the mission of spreading energy far and wide from the equator to the poles, and into space, the final frontier. Here’s how it goes. Working together as companion fluids, and feeding off each other, they make winds, waves, weather and climate. But make no mistake: Ocean is Batman, Atmosphere is Robin; Ocean is Captain Kirk, Atmosphere is Spock; Ocean the dog, Atmosphere the tail. Updated May 11,18 and 19 with text added at the end. Further update on May 27 at the end. You only have to compare Sea Surface Temperatures (SST) from HADSST3 with estimates of Global Mean Surface Temperatures (GMST) from Hadcrut4 and RSS. This first graph shows how global SST has varied since 1850. There are obvious changepoints where the warming or cooling periods have occurred. This graph shows in green Hadcrut4 estimates of global surface temperature, including ocean SST, and near surface air temperatures over land. The blue line from RSS tracks lower tropospheric air temperatures measured by satellites, not near the surface but many meters higher. Finally, the red line is again Hadsst3 global SST All lines use 30-month averages to reduce annual noise and display longer term patterns. Strikingly, SST and GMST are almost synonymous from the beginning until about 1980. Then GMST diverges with more warming than global SST. Satellite TLT shows the same patterns but with less warming than the surface. Curious as to the post 1980s patterns, I looked into HADSST3 and found NH SST warmed much more strongly during that period. This graph shows how warming from circulations in the Northern Pacific and Northern Atlantic drove GMST since 1980. And it suggests that since 2005 NH SST is no longer increasing, and may turn toward cooling. Now one can read convoluted explanations about how rising CO2 in the atmosphere can cause land surface heating which is then transported over the ocean and causes higher SST. But the interface between ocean and air is well described and measured. Not surprisingly it is the warmer ocean water sending heat into the atmosphere, and not the other way around. The graph displays measures of heat flux in the sub-tropics during a 21-day period in November. Shortwave solar energy shown above in green labeled radiative is stored in the upper 200 meters of the ocean. The upper panel shows the rise in SST (Sea Surface Temperature) due to net incoming energy. The yellow shows latent heat cooling the ocean, (lowering SST) and transferring heat upward, driving convection. As we see in the graphs ocean circulations change sea surface temperatures which then cause global land and sea temperatures to change. Thus, oceans make climate by making temperature changes. The surface of the world’s oceans has been warming since the beginning of industrialization. In addition to this, multidecadal sea surface temperature (SST) variations of internal [natural] origin exist. Evidence suggests that the North Atlantic Ocean exhibits the strongest multidecadal SST variations and that these variations are connected to the overturning circulation. This work investigates the extent to which these internal multidecadal variations have contributed to enhancing or diminishing the trend induced by the external radiative forcing, globally and in the North Atlantic. A model study is carried out wherein the analyses of a long control simulation with constant radiative forcing at preindustrial level and of an ensemble of simulations with historical forcing from 1850 until 2005 are combined. First, it is noted that global SST trends calculated from the different historical simulations are similar, while there is a large disagreement between the North Atlantic SST trends. Then the control simulation is analyzed, where a relationship between SST anomalies and anomalies in the Atlantic meridional overturning circulation (AMOC) for multidecadal and longer time scales is identified. This relationship enables the extraction of the AMOC-related SST variability from each individual member of the ensemble of historical simulations and then the calculation of the SST trends with the AMOC-related variability excluded. For the global SST trends this causes only a little difference while SST trends with AMOC-related variability excluded for the North Atlantic show closer agreement than with the AMOC-related variability included. From this it is concluded that AMOC [Atlantic meridional overturning circulation] variability has contributed significantly to North Atlantic SST trends since the mid nineteenth century. After a decrease of SST by about 1 °C during 1964–1975, most apparent in the northern tropical region, the entire tropical basin warmed up. That warming was the most substantial (>1 °C) in the eastern tropical ocean and in the longitudinal band of the intertropical convergence zone. Examining data sets of surface heat flux during the last few decades for the same region, we find that the SST [sea surface temperature] warming was not a consequence of atmospheric heat flux forcing [greenhouse gases]. Conversely, we suggest that long-term SST warming drives changes in atmosphere parameters at the sea surface, most notably an increase in latent heat flux, and that an acceleration of the hydrological cycle induces a strengthening of the trade winds and an acceleration of the Hadley circulation. 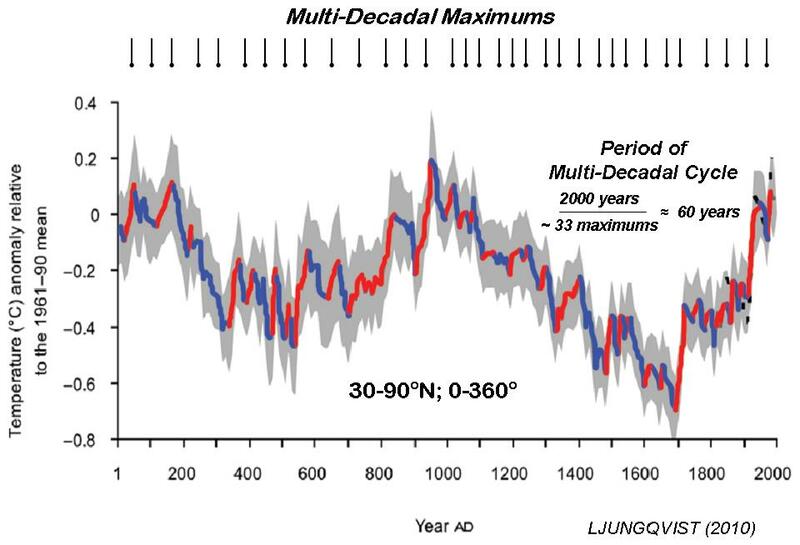 These trends are also accompanied by rising sea levels and upper ocean heat content over similar multi-decadal time scales in the tropical Atlantic. Though more work is needed to fully understand these long term trends, especially what happens from the mid-1970’s, it is likely that changes in ocean circulation involving some combination of the Atlantic meridional overtuning circulation [AMOC] and the subtropical cells are required to explain the observations. The Atlantic Meridional Overturning Circulation (AMOC) is a key component of the global climate system, responsible for a large fraction of the 1.3 PW northward heat transport in the Atlantic basin. Numerical modelling experiments suggest that without a vigorous AMOC, surface air temperature in the North Atlantic region would cool by around 1–3 °C, with enhanced local cooling of up to 8 °C in regions with large sea-ice changes. 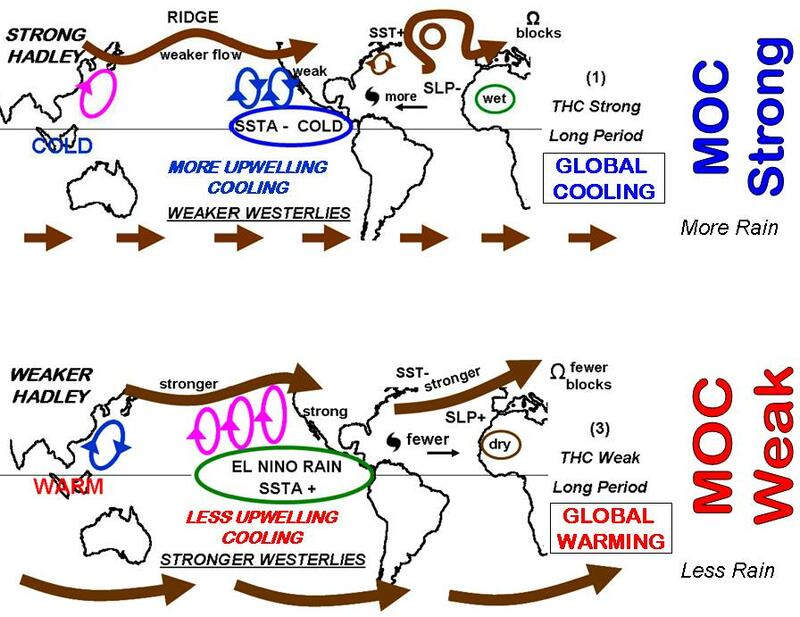 Substantial weakening of the AMOC would also cause a southward shift of the inter-tropical convergence zone, encouraging Sahelian drought, and dynamic changes in sea level of up to 80 cm along the coasts of North America and Europe. This graph from Mike at climategrog shows more empirical evidence for ocean climate making, this time the relation to CO2 concentrations. The chart shows a high correlation between rates of change, not comparing directly the temperature or CO2 values or anomalies. Thus, a positive datapoint in the graph means an increase in the rate of change, negative being the rate changing downward. The infrared radiation emitted from the ocean is quickly absorbed and re-emitted by water vapor and carbon dioxide and other greenhouse gases residing in the lower atmosphere. Much of the radiation from the atmospheric gases, also in the infrared range, is transmitted back to the ocean, reducing the net long wave radiation heat loss of the ocean. Net back radiation cools the ocean, on a global average by 66 watts per square meter. When air is contact with the ocean is at a different temperature than that the sea surface, heat transfer by conduction takes place. On average the ocean is about 1 or 2 degrees warmer than the atmosphere so on average ocean heat is transferred from ocean to atmosphere by conduction. If the ocean were colder than the atmosphere (which of course happens) the air in contact with the ocean cools, becoming denser and hence more stable, more stratified. As such the conduction process does a poor job of carrying the atmosphere heat into the cool ocean. On global average the oceanic heat loss by conduction is only 24 watts per square meter. The largest heat loss for the ocean is due to evaporation, which links heat exchange with hydrological cycle (Fig. 4). On global average the heat loss by evaporation is 78 watts per square meter.